Home DIY Projects	How to Organize a Coat Closet for $10! Greetings, my organized friends! Well, if you are like me, you are trying to get more organized this year! Yesterday I tackled our Coat Closet. In fact, I’m a little embarrassed to share the before pictures. But, I promise, it looks much better today! Come see how to organize a coat closet for $10! From what I understand, a coat closet is for coats. Theoretically, when you have company there is room in the coat closet for their coats as well. Not so much at our house. My husband and I each have several coats and jackets and they tend to take up the majority of the closet, which handily is right beside the front door. Recently we had a party, and I had guests put their coats and purses on our bed in the master bedroom because the coat closet was full. Of our coats. (Plus I didn’t want them to see my messy closet.) This got me thinking perhaps it’s time to clean out the coat closet? Here is the before picture. Along with a ton of coats, there was stuff on the shelves and on the floor. Yikes! I had these 4 wicker baskets from our last house. (See our former laundry room below.) Previously each basket had a name so when I did laundry, I had a designated basket for each family member for small items like socks and underwear. In this house, I did away with the baskets which forces me to put the clothes away as soon as they are clean and folded. Novel concept, I know. 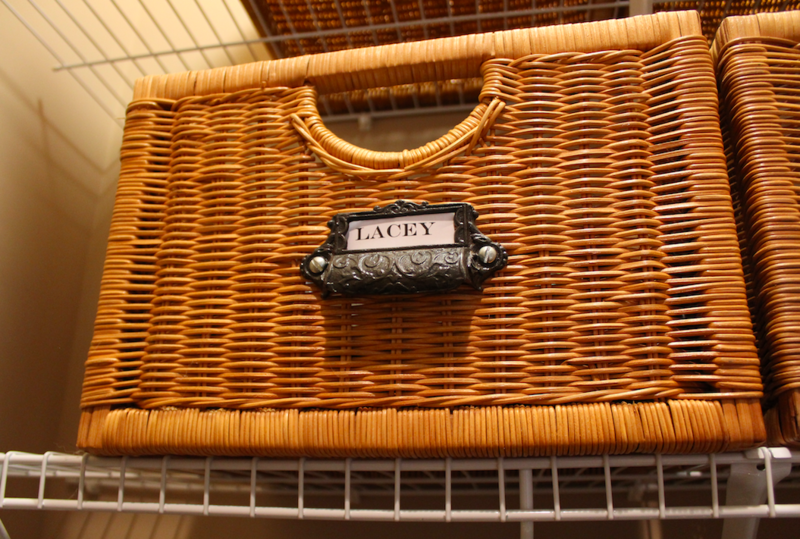 So, for this house, I thought it would be nice to reuse the baskets and label each one with its contents and put on the shelves in the coat closet within easy reach. Because Lacey has several leashes, collars and poop bags, I wanted a place to neatly corral her things too. Therefore, she gets her own basket. I printed out labels on the computer using Microsoft Word. I picked a font I liked in a large size and printed the labels in all capital letters which are easy to read. I cut them down with scissors and tucked them in each pull. In addition to Lacey’s basket, I made one for hats, gloves and scarves. Small baskets are perfect for this job. I put all 30 hangers in the coat closet and allowed my husband and me 3 coats each. That leaves 24 hangers for other people’s coats. The hangers have a slim profile too, which saves space. I love the fact all of the hangers match now. This makes the closet instantly seem more organized and put together.